Wilson is a household name when it comes to making products for the sporting goods industry. Wilson manufactures a product for nearly every sport from tennis to football. They also have been known to make other table games such as air hockey. You can hardly walk through a department store in the United States without coming across multiple products made by the Wilson company. However, when it comes to making foosball tables, Wilson does not have quite the reputation as they would like to have. 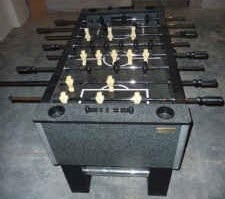 The problem is that the foosball parts on a high quality table are so expensive that it makes it hard to build a quality table that everyone can afford. The table does have some nice features like the adjustable legs and inset cup holders, but it is not a competition level table with high quality foosball table features. 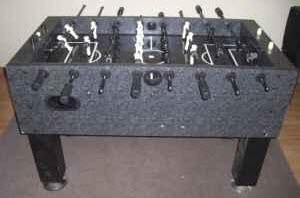 This Wilson foosball table is priced at $200 US.